Cognitive-neuroscience explains agential behaviour in terms of information processing realised physically in biological mechanisms. As scientifically rigorous as these explanations may be, they do little to elucidate our every-day conscious experience as agents. 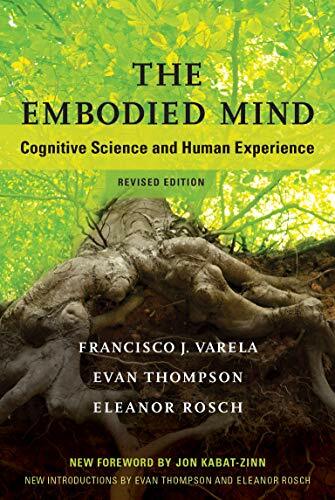 In 1991, Francisco Varela, Evan Thompson, and Eleanor Rosch (VTR), published The Embodied Mind: Cognitive Science and Human Experience (Varela, Thompson, & Rosch, 1991). There, the perception scientist (Varela), philosopher (Thompson), and psychologist (Rosch) proposed to bridge this gap between our science and experience of the mind. They insist that a cognitive science that dispenses entirely of mind talk, choosing instead to talk in terms of formal computation and neuro-mechanisms, misses something crucial about the mind and phenomenal experience. These two things can be brought into closer fit through VTR's phenology and Buddhism informed enactivist cognitive science. VTR's enactivism explains cognition in terms of "a history of structural coupling that brings forth a world" (VTR 2016: 206). This is in opposition to classical cognitivist approaches, which talk in terms of "rule-based manipulation of symbols" (42). These views are neatly summarised on pages (42-43) and (206). For VTR, their enactive view of the mind does not at all match the picture presented by a sort of Cartesian introspection and so may sound rather in plausible. Evidence supporting such a view of the mind comes in the form of the Buddhist teachings known as the Abhidharma and meditation induced experiences. In these teachings and through meditation, we find aggregates of sensations, habits, and so on, rather than a transcendental unified and persisting self. When initially released, The Embodied Mind was seen as ambitious (Dreyfus, 1993) and revolutionary in flavour if not in vision (Dennett, 1993). In addition to their sketch of an alternative research program for cognitive science, VTR present what they see to be the biggest philosophical implications of this self-less view of the mind. For VTR, this view of the mind entails the rejection of objectivism: there is no common ground. Rejecting objectivism may be enough to induce fears of nihilism for some, but VTR reassure us that we are heading in the right direction. Nihilism in only problematic if not pursued to its proper conclusion. For one representative of the Madhyamaka tradition, Nāgārjuna, the ego-less view of the mind is a good thing, permitting us to shed "the constant anxiety and irritation of egoistic concern" (VTR 2016: 234). Using the Zen Buddhist philosophy of Nishitani, VTR argue that pessimistic nihilism is symptomatic of our habitual and impulsive grasping for some objective ground. Finding only the inexistence of any objective ground, we treat this as the objective ground. VTR advise us to instead embrace groundlessness. Groundlessness, they suggest, releases us from much of our worldly suffering and anxiety, allowing us to live in a better, more compassionate world. A generation after its initial release, VTR's enactivist vision has not been wholly realised and we are far from living in a more compassionate world. Still, The Embodied Mind has had a lasting impact on cognitive science and many of its themes continue to be explored today. Rosch, one of the surviving co-authors, describes the book as "more relevant and probably more accessible" today than back in 1991 (xxxvi). For anyone who has not yet read The Embodied Mind, MIT's release of a (2016) revised edition is a good excuse to finally get familiar the seminal text (Varela, Thompson, & Rosch, 2016). It can at times be a difficult read. Not only is its scope wide, but the topics it covers are complex. The Abhidharma framework outlined in chapter 4, for example, is a lot to digest in short space (helpful appendices can be found after the main text and it would be wise to keep these pages bookmarked for easy access). For those who have read the book before, the revised edition contains two new introductions by Thompson and Rosch (the surviving authors) and a foreword by Jon Kabat-Zinn (the creator of the mindfulness-based stress reduction program). This front matter (all up about 50 pages worth) is both stimulating and revealing. Thompson admits he and his co-authors made three mistakes. First, they were wrong about Western phenomenology, which they represent as a "failed or broken down philosophical project" (xxii). Empirical and theoretical work since the publication of the book provides many counter-example to such a view. Second, VTR were wrong to suggest that the teachings of Abhidharma and Madhyamaka are derived directly from mindfulness meditation. This is because mindfulness meditation is a prominent feature only of Buddhist modernism, and Abhidharma and Madhyamaka predate this movement. Finally, VTR were wrong to assume that mindfulness meditation somehow gives us privileged access to the mind. In the original text, VTR often treat meditation-induced experiences as somehow revealing that the self is a disunified aggregate of experiential events. However, as Thompson says, this could simply be another constructed view of the mind, not a more accurate one. In her introduction, Rosch repeats her co-author's regrets: there is no real reason to think that mindfulness meditation is mind-revealing rather than mind-altering. Rosch also expresses caution around mindfulness research that uses measurement scales tracking Western mental health variables, rather than anything related to the original tradition. These scales may fail to detect the interesting benefits of mindfulness practices simply because those benefits do not correspond well to the researcher's measurements and research goals. Rosch is also wary of the over-use of technology like fMRI, which is sometimes more obscuring than enlightening. Attending to the bodily aspect of cognition, she reminds us, does not mean simply attending to the brain. Among Rosch's list of five reasons why the Embodied Mind is "more relevant and probably more accessible" today than it was in 1991 (xxxvi) is: the amount of mindfulness science being conducted has increased; and the philosophy of enactivism has grown. The vision of enactivist cognitive science may yet be realised. In summary, the book's original text covers many topics as it presents its ambitious view of cognitive science and the mind. Each part of The Embodied Mind is thought provoking and interesting in its own right, and the revised edition remains fresh for new readers. Familiar readers returning to the classic will find enough of substance in the new material alone to warrant spending an evening with the book. Varela, F. J., Thompson, E., & Rosch, E. (1991). The Embodied Mind: Cognitive Science and Human Experience. Cambridge: MA: MIT press. Varela, F. J., Thompson, E., & Rosch, E. (2016). The Embodied Mind: Cognitive Science and Human Experience (2nd ed.). Cambridge: MA: MIT press.